The first thing that struck Nell Sweeney about that morning’s Daily Advertiser, even before the front page headline in inch-high type, was the illustration that accompanied it. It was a portrait in three-quarter profile, deftly inked, of a lady of dark and arresting beauty: feral eyes, audacious cheekbones, rouged lips parted to bare the edges of her teeth. Diamonds encircled her throat and her great, gleaming torrent of loose hair. She gripped a dagger the size of a butcher knife with both hands. The caption read The Late Mrs. Kimball as Lady Macbeth. Late? Taking a seat at the kitchen table–a slab of age-scarred pine that could seat all twenty of the Hewitt family’s servants at once, when required–Nell set down her coffee cup and unfolded the newspaper. 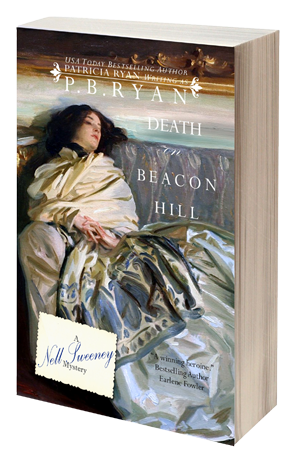 “You reading about that actress that got killed?” Peter, one of the Hewitts’ two young blue-liveried footmen, looked up from across the table, where he was working his way through a breakfast of cold ham, creamed chicken hash, and scones. Nell held a finger to her lips and shot a glance toward the huge cookstove across the room, where little Gracie Hewitt stood on a stepstool to stir a pot of porridge under the supervision of Mrs. Waters, her Nana’s cook. The old bird had pitched a fit the first time Nell brought the child down to the kitchen before dawn to see how the breakfasts delivered to her nursery every morning were actually prepared. Family members didn’t mix with the household staff, and they certainly didn’t partake in household chores. It was only when Viola Hewitt herself intervened, decreeing that Gracie should be taught whatever Nell, as her nursery governess, deemed appropriate, that Mrs. Waters had grudgingly relented. “I saw her in Romeo and Juliet when I was just a kid–not a regular performance, just a rehearsal, but they were wearing their costumes. Me and my cousin Liam, we sneaked into the Boston Theatre one afternoon and hid up in the dress circle, just to catch a glimpse of her in the flesh. We used to see her picture on playbills and the like. She was even more beautiful in person, if you can believe it, and she wasn’t any young chickabiddy back then. She must have been… Let’s see, this was the summer I turned eleven, so it was back in fifty-six, and the paper said she was forty-eight when she died, so…” His brow furrowed as he chewed over the math. “She would have been thirty-five.” The artist who’d drawn Mrs. Kimball had captured a snap of electricity in her eyes…half madwoman, half seductress. “Proscenium boxes,” Nell said. They were the most luxurious boxes in the largest and most opulent theater in the city–maybe in the whole country. The top box on stage right was under subscription by the Hewitts. “‘Will,’ is it?” Peter asked with a quizzical little quirk of his eyebrows. “‘Dr. Hewitt,’ I meant. His mother calls him Will, so…” Nell hoped the warmth rising up her throat wouldn’t ignite into one of those scalding, tell-tale blushes, the bane of her existence. Thankfully, Peter was one of the few Hewitt retainers who actually considered her a friend; she mustn’t let herself slip like that in front of the others. She said, “Someone once told me that Dr. Hewitt had had a brief…flirtation with Mrs. Kimball.” The eldest of the Hewitts’ four sons, Will had indulged in a weakness for actresses during his visits home from England, where he’d been brought up and educated. “You knew who he was?” Nell asked. “You were just a boy. This was long before you came to work for the Hewitts, and back before the war, Dr. Hewitt only spent a few weeks out of every year in Boston. There were acquaintances of his parents who didn’t even know he existed.” Bizarre, considering the family’s position in Boston society, but Will had always nurtured a contempt for that world, and avoided it during his school holidays. And, too, he’d been at odds with the family patriarch, the venerable August Hewitt, since early childhood–hence his exile to England, where relatives had shunted the young firebrand from boarding school to boarding school, and finally to Oxford. It wasn’t until he took his fate in his own hands, defying his father to study medicine at the University of Edinburgh, that he began to feel as if he had a place in the world, a role, a purpose. Then came the war, and all that changed. Will had returned to the states when war was declared to offer his medical services to the Union Army. Of the other three Hewitt sons, the next eldest, Robbie, was the only one to volunteer. Harry, the third son and as selfish a lout as ever drew a breath, had made excuses to stay home, and Martin was simply too young. Viola Hewitt had once shown Nell a photograph taken of her two eldest sons after their enlistment in the Fortieth Massachusetts Mounted Infantry. Will and Robbie had struck dashing figures in their blue, brass-buttoned frock coats and slouch hats–especially the tall, angular Will, who wore an officer’s saber belted over a maroon sash, his status as a battle surgeon having earned him the rank of major. Robbie, who’d mustered in as a sergeant, had achieved a captaincy by February of ’64, when both brothers were captured at the Battle of Olustee and condemned to the Confederacy’s notorious Andersonville prison camp–a hell on earth that claimed Robbie’s life and left Will grievously wounded, both in body and in soul. Nell ate the offered spoonful with a great show of relish. “Oh, that’s really good, sweetie. That’s some of the best porridge I’ve ever had. You’re turning into quite the cook.” She reinforced the compliment with a hug, whereupon the child returned to her stool and Nell to her conversation. “Yes, I imagine she did,” Nell murmured as she turned her attention to the newspaper article. Mrs. Virginia Kimball, First Lady of the Boston Stage, has been wrenched from the world by an act of unspeakable violence. Yesterday at approximately 4 o’clock in the afternoon, Mr. Maximilian Thurston, a playwright of some note in this city, arrived at the Mt. Vernon St. home of Mrs. Kimball, his neighbor and longtime acquaintance, for the pot of tea which it was their daily custom to share at that hour. Upon knocking twice and receiving no answer, Mr. Thurston opened the door and called out, “Virginia! Are you home?” The fretful visitor searched the ground floor of the townhouse, and upon finding no one about, proceeded upstairs, only to encounter a scene of the most gruesome and lamentable nature. Mrs. Kimball lay in the open doorway of her bedroom, the bodice of her walking dress soaked with blood. On the floor nearby rested a Remington pocket pistol, which Mr. Thurston recognized as belonging to the actress. Although mortally wounded, she yet retained the spark of life, enough so to clasp Mr. Thurston’s hand before expiring in his arms. 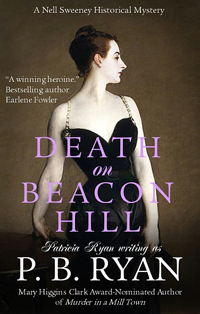 He was to receive a second shock upon discovering, on the floor at the foot of Mrs. Kimball’s bed, the lifeless body of her young maid, Fiona Gannon, who had been shot in the head. Already there are many rumors afloat relative to this tragic affair, which is perhaps to be expected, given the notoriety of the deceased and the circumstances of her demise. One such rumor, the veracity of which has yet to be determined, is that Miss Gannon was found clutching a number of her late mistress’s famous diamond necklaces. Parties have been dispatched by the authorities to the scene of the murder, and a coroner’s inquest will be held this afternoon, which will doubtless shed further light upon this sad affair. Mrs. Kimball had no known next of kin, the details of her life prior to her arrival in this city some twenty years past being shrouded in mystery. For this reason, her personal attorney, Mr. Orville Pratt of Pratt and Thorpe, has taken on the melancholic duty of making his late client’s final arrangements. Mrs. Kimball is to be interred in Roxbury’s Forest Hills Cemetery following private funeral services at the Arlington Street Church tomorrow, the 3rd of June, at ten o’clock in the morning, the Reverend Dr. Ezra Gannett to officiate. It is Mr. Pratt’s intention to mark the grave with a handsome tombstone. He believes Mrs. Kimball to have been 48 years old at the time of her passing, although her precise age, like so many other details of her life, will doubtless remain a matter of speculation for some time. All Nell knew about Unitarianism was that staunchly devout August Hewitt was in the habit of accusing his youngest son, Martin, a Harvard divinity student, of leanings in that direction. So opposed was Mr. Hewitt to any whiff of liberality in his Sunday services that he’d recently severed his relationship with King’s Chapel, which he and Viola had attended for some thirty-two years, in favor of the resolutely Congregationalist Park Street Church. His wife’s continued allegiance to the nominally Episcopalian King’s Chapel, which he considered “secretly Unitarian,” rankled him–it didn’t look right, he said, for a couple of their standing to attend different churches–but Viola Hewitt had always made her own decisions, and that wasn’t about to change any time soon. For Nell, who’d never been able to sort out the differences between the various Protestant denominations, the rift was perplexing at best. Following Dennis down the stairs was the parlormaid Mary Agnes Dolan, busily tucking her great froth of red hair–wild as spun copper–into her white ruffled maid’s cap. She and Dennis grabbed plates and set about filling them up at the cookstove. “I worked up an appetite between then and now.” Dennis caught the eye of Mary Agnes, who smirked and nudged him with her shoulder. Peter looked at Nell and then quickly lifted his teacup, ears reddening. Dennis scooped up the newspaper and handed it to Mary Agnes as they sat side-by-side at the other end of the table. “That’s the one I was telling you about,” he said, pointing to the picture of Virginia Kimball as he speared a slice of ham with his knife and lifted it to his mouth. “What did you mean about people not wanting to be seen at her funeral?” Nell asked. “Watch your mouth in front of the lady,” Peter warned. “You might at least mind what you say in front of Gracie,” Nell said. “What about me?” Mary Agnes demanded through a mouthful of hash, scowling petulantly when no one responded. Nell leaned toward Dennis and said, in a voice strained with fury, “If Mrs. Hewitt were to find out what you just called that child, she would sack you on the spot, and without references.” When Viola adopted the newborn Gracie five years ago, she made it clear to her household staff that the child was to be treated exactly as if she’d been born into the family. Any reference to her being the illegitimate child of a former chambermaid would be punished with dismissal. “You gonna tattle on him?” Mary Agnes sneered. High-reaching. Highfalutin. Lace-curtain. Priggish. Stiff-rumped… Nell had heard them all, and then some. Being a governess–that is to say, neither servant nor gentlewoman, but that most exotic of species, an independent working woman–was complicated enough, inasmuch as one never quite fit in, either with the household staff or the family. But being a governess who’d sprung from such humble roots, most having been born into the upper classes, meant that not only was she unique, she was uniquely reviled. The rank and file servants–most of them, anyway–resented the special treatment they felt she’d somehow finagled for herself. As for the nobs, well, there were exceptions, like Viola and Will, but the majority neither understood nor trusted her; some, such as August Hewitt and his son Harry, viewed her with outright suspicion, if not loathing. In the Hewitts’ household–indeed, in their entire world of Brahmin pomp and privilege–there was literally no one quite like Nell, no established niche for her in the caste system, no recognized rules of comportment, no place. On the one hand, it could be, and often was, a somewhat lonely existence. On the other, the lack of ready-made parameters left her free to establish her own, within certain limits–which she’d gotten awfully adept at stretching. “Brady sure seems to think so,” Dennis said with a snicker. “What do you mean?” Nell asked. Brady, the Hewitts’ driver, had become, during Nell’s five years with the family, almost like a father to her. “Where is he now?” Nell asked. “Go,” Peter said, shooing her up from the table and out the back door. Nell stepped outside to find the half-risen sun casting a sanguine luminescence over the backyard. It was a small yard, absurdly so considering the size and grandeur of “Palazzo Hewitt,” as Will had dubbed the Italianate mansion overlooking Boston Common. Viola had planted a charmingly frowsy English-style garden on the tiny patch of land, framed on either side by ivy-covered trellises and in back by a sizable red-roofed Tuscan cottage that served as a carriage house–or, more accurately, a combination stable and carriage house, half the ground floor being fitted out with horse stalls, while the other half housed the Hewitts’ fleet of coaches and buggies. The sprawling second floor provided living quarters for Brady and most of the other male servants. Once, shortly after she’d first come to work for the Hewitts, Nell had addressed the amiable Irishman as “Mr. Brady.” He’d laughed and said, “It’s just Brady, miss–plain old Brady.” She had no idea whether that was his first or last name. To this day, despite their close friendship, he insisted on addressing Nell as Miss Sweeney in deference to her station within the household. She creaked the door open and entered the long, stone-walled carriage bay, which was utterly silent save for the rustling of her skirts. It was cool inside, and dim, the windows being few and small. Through the arched doorway to the right came muffled whinnies and the scents of horseflesh and hay. To the left stretched a shadowy double row of vehicles, with a corona of light at the very end. Squinting, Nell made out a lantern hanging from one of the far back rafters. She walked toward the light, passing Mr. Hewitt’s one-seat bachelor coupe, Viola’s elegant little Victoria, Martin’s Coal Box buggy, the pony wagonette that had been Gracie’s Christmas present from Viola last year, a four-passenger bob sleigh for winter traveling, two nondescript gigs and a cart for the servants’ use, and finally the gem of the collection, the family brougham. The stately coach shone like black glass through a constellation of droplets, except for the oilcloth-draped driver’s seat. Water dripped from its body and wheels, dissolving into the floor of packed earth; a bucket with a washrag slung over it stood on a bench in the corner. Brady, in shirtsleeves and a damp canvas apron, his back to Nell, stroked a chamois methodically over the vehicle, coaxing it to a high gloss as he dried it off. “Did you know her?” Nell asked softly. “Fee Gannon. Fiona, but we called her Fee. My little sister’s girl.” He sniffed, straightened up, and resumed his polishing. “Oh, Brady, I’m sorry.” She came closer, rested a hand on his broad back. He just kept on rubbing the chamois over the brougham, taking care to obliterate every trace of moisture from its surface. “No you don’t,” Brady said as he spun to face her. It was the first time he’d ever raised his voice to her, and it stabbed something deep inside her, something that made her feel alarmed, uprooted. “You can’t know, because you didn’t know her.” His chin quivered; tears spilled from his eyes. “You didn’t–” The words died on a choking sob. He slumped against the brougham, the chamois fluttering to the floor, his big, work-roughened hands shielding his face. He was crying in earnest now, amidst muttered imprecations that she couldn’t quite make out. She handed him her handkerchief. He covered his face with it and doubled over, great, hoarse sobs heaving out of him while she patted his back and made comforting noises. The carriage bay grew brighter during the several minutes it took Brady to pull himself together. Sunlight streamed through the east-facing windows, gleaming off the brougham. “I’ll have it cleaned,” he said as he folded it up into a neat square. “I don’t care about the handkerchief, Brady,” Nell said as she smoothed his disheveled hair. “I care about you. I feel so…” Helpless. Frightened. He was like her father–more of a father, certainly, than her real father had been. He’d always been there for her, rock-solid, cheerful, reliable. Every Sunday morning, before dawn, he drove her up to St. Stephen’s in the North End for early mass. They’d take one of the little gigs so that they could sit next to each other and talk. He’d offer advice, tell her jokes… Sometimes he even sang to her–hymns or drinking songs, depending on his mood. To see him undone like this… It felt as if the very earth were sliding out from beneath her feet. Nell said, “I remember you mentioning her.” Brady rarely talked about himself, but he’d spoken with affection of “Fee,” for whom he’d found a position in service when she was orphaned in her teens; that would have been a year or two before Nell came to Boston. “I thought she worked for the Pratts,” Nell said. Orville Pratt, one of the wealthiest and most powerful men in Boston, had a law practice with August Hewitt’s closest friend, Leo Thorpe. Nell nodded noncommittally, all too aware of how it felt to play a role, and chagrined that this man to whom she’d grown so close had no idea who and what she’d really been in her earlier years. The only person who knew everything–the only person in Boston–was Will Hewitt. “Yeah, she was savin’ her money for it–what little she made. They paid her a buck and a half a week. God knows how long it would have taken her, but she was real keen on the idea. She’d always loved…fripperies and trifles and such. Ribbons and laces…gloves, parasols, bonnets… Bonnets, especially, she was forever goin’ on about them. She aimed to sell yard goods, too, I think, and writing paper and the like. Other things. She used to go on and on about it. I can’t remember it all. I reckon I wasn’t really listening, on account of I didn’t think anything would ever come of it.” He closed his eyes, rubbed his face. “When did she start working for Virginia Kimball?” Nell asked. “As a chambermaid?” Nell asked. “Emily, that’s right. I said maybe Miss Emily could put in a good word with her parents, and if that didn’t work, I’d try to get Mrs. Hewitt to help, but Fee wouldn’t hear of it.” He shook his head, looking weary, grayish. “It was that important to you?” Nell asked. Nell didn’t know how to respond to that, given that he was probably right. If she could clear it. How would Brady take it, Nell wondered, if it turned out Fiona Gannon was just as guilty as she seemed?